So its officially Spring, and over the past week we've had rain, sunshine and even snow up North, a great start to the season. 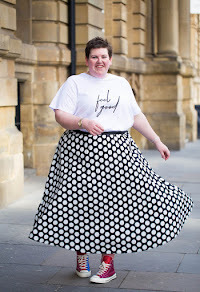 As much as i love living in jeans, it was defiantly time to change things up a little, and bring out my skirts in an attempt to wear them with out tights! yes i actually left the house with bare legs. 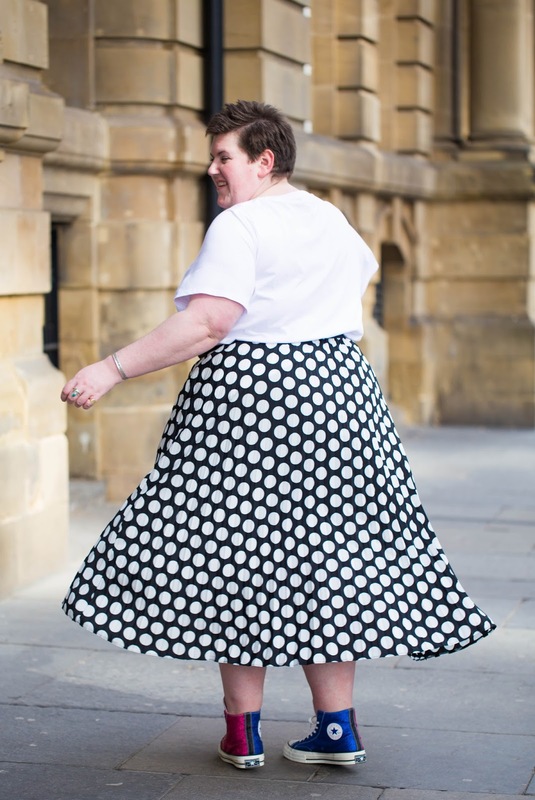 Ok the skirt i chose to wear may have been ankle length but it was defiantly a brave thing to do, as you can see from some of the pics there was a little wind in the air. In keeping with a trend for Spring and of course my biggest love at the moment i went for a very bold skirt choice, in the shape of this black and white spot number that i picked up from Simply Be last year. 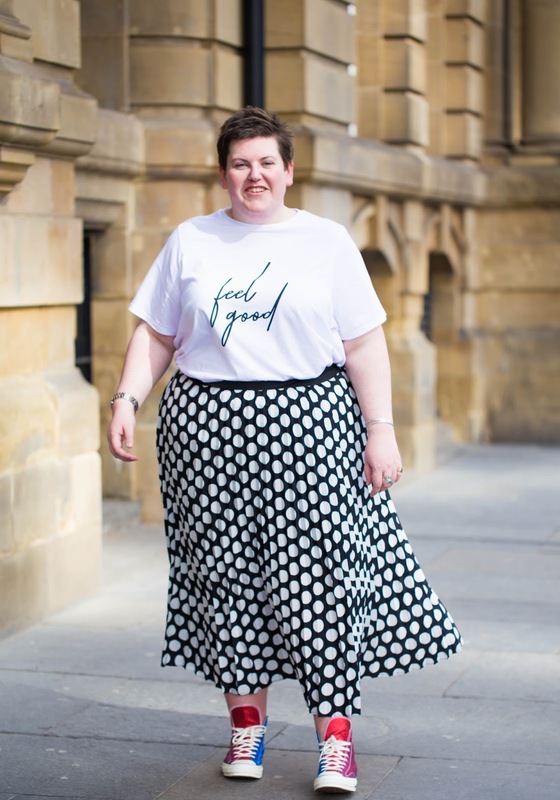 I love nothing more than wearing a bold skirt with a simply tee during the warmer spring days, and this "feel good" one i recently picked up for River Island is my current favourite, and defiantly describes how i felt wearing this outfit around the Newcastle Quayside. 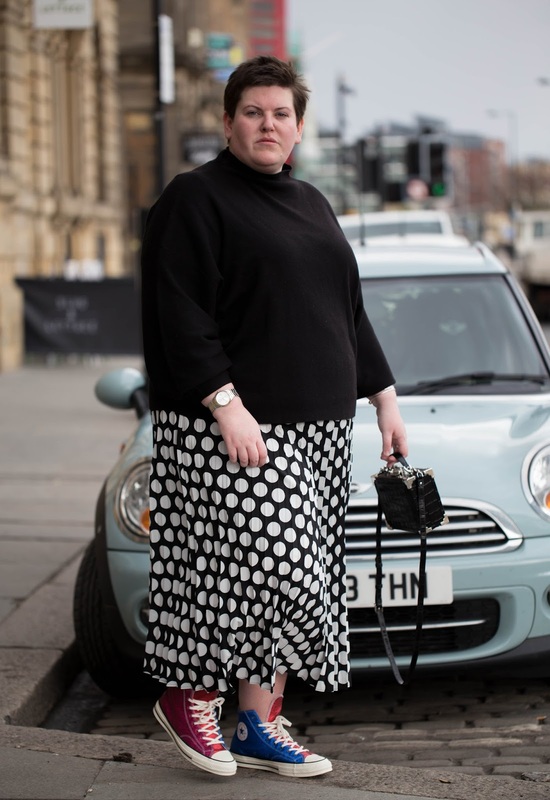 While there was a little cool wind in the air this black jumper from H&M keep me warm and it just so happen to work with the out fit as a whole. 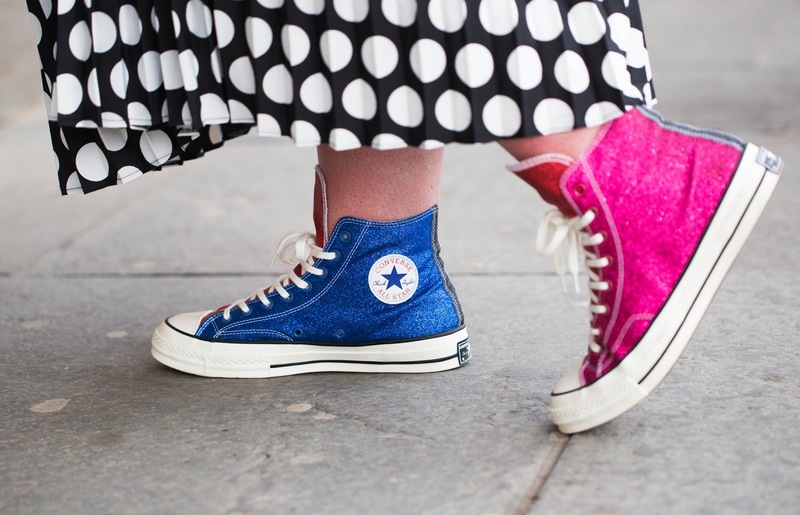 By some miracle i managed to get my hands on a pair of these multi coloured Converse from their collaboration with JW Anderson are a little out there and maybe not to everyones taste but I'm in love with them, everyone should have a touch a sparkle in their shoe closet and they go perfectly with black a white, I would wear these every day if could! My new trunk bag from Aspinal of London is the perfect size and i some how manage to fit all of my daily essentials inside (more on that in another post). I prefer to carry it by the handle but with the shoulder strap its perfect to wear cross body when you have too many shopping bags to carry or just want to be hands free to take that all important Instagram shot.